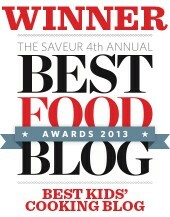 Written by Jennifer Murch of Mama’s Minutia. 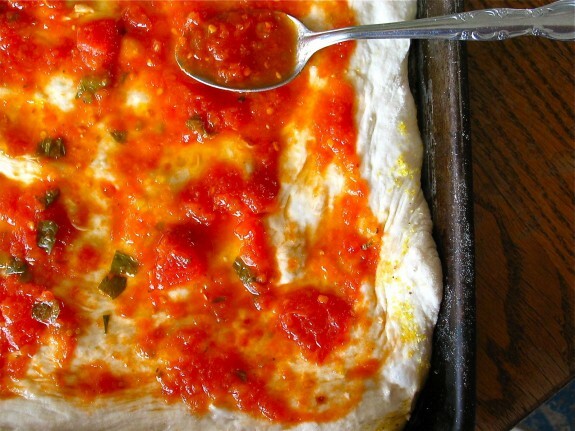 There are as many ways to make homemade pizza sauce as there are people. Ask two (or two hundred) home cooks how they make their pizza sauce and I can guarantee every single answer will be different. Even I can’t settle on just one method/recipe—it all depends on the season, what’s in my kitchen cupboards, and my mood. In this post I will explain some of the different tomato-to-sauce processes, as well as share several of my favorite recipes for pizza sauce. I hope you’ll find something that works for you! Paste tomatoes work best for sauce—they have more flesh and less juice so less time and energy is required to extract the extra liquid. Juice tomatoes (as long as they are still high-acid) may be used in place of paste tomatoes, but more time and energy will be required to reach sauce-consistency. Wash, blanch, peel, and core the tomatoes (as instructed HERE). Chop them up and run them through a food mill. Pour the tomato juice into a heavy-bottomed kettle and simmer, stirring frequently, until a bunch of the liquid has boiled away and the sauce has thickened to your specifications. Wash, blanch, peel, and core the tomatoes. Roughly chop them with a knife (or smoosh them with your fingers) and then use an immersion blender, or a regular stand blender, to puree them the rest of the way. Pour the tomatoes into a heavy-bottomed kettle and simmer, stirring frequently, until a bunch of the liquid has boiled away and the sauce has thickened to your specifications. Note: If you want a chunkier sauce, skip the mechanized puréeing. Cut them in half and roast on baking sheets in the oven for an hour before blending them. Simmer the sauce on the stove top if the sauce needs to be reduced further. If the sauce isn’t as smooth as you’d like, pass it through a fine-mesh strainer or food mill. This is the fun part. The sauce is your canvas. Play! Be creative! Have fun! 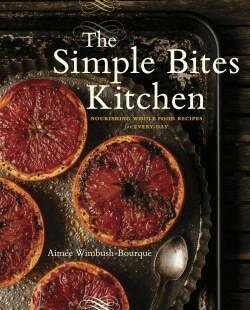 I hope the wide variety of methods and recipes presented here serves to inspire rather than to confuse or overwhelm. When it comes to pizza sauce (and pizza dough and canning and parenting and loving, and pretty much everything else in life) the bottom line is: there’s no single right way. If you have a basket of tomatoes, a sharp knife, and a few hours to play, you are certain to find a delicious pizza sauce recipe. And that’s a promise. While tomatoes are quite acidic, certain additions such as olive oil, fresh herbs, and other vegetables will neutralize the sauce. So don’t get too carried away. Think proportionally: about 8 parts acidic tomatoes to 3 parts non-acidic additions, plus a shot of extra acid to keep it safe. For extra acid, simply add 2 tablespoons vinegar or bottled lemon juice, or ½ teaspoon citric acid (found in the canning section of most grocery stores), to each quart. To pints, reduce those amounts by half. Count on one cup of sauce for one large pizza. 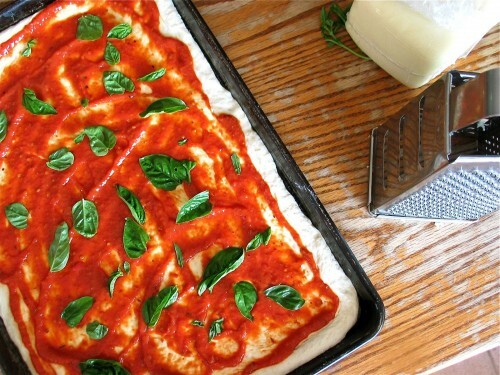 My favorite recipe for pizza dough can be found HERE. 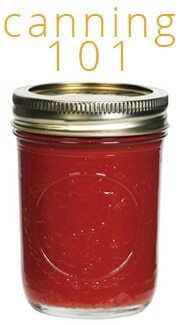 Be sure to refer to our post on Canning Basics for step-by-step instructions on how to sterilize, fill and lid jars, plus the low-down on processing, before you can your sauce. This recipe comes from my Aunt Valerie, the Canning Queen. There is no need to add more acid to this recipe as there are no fresh veggies and the herbs are dried. Combine and can according to these instructions. If no fresh herbs are available, substitute 3 tablespoons dried for each half cup of fresh. Add the remaining ingredients (minus the citric acid) and simmer for an hour, uncovered, stirring frequently. When the sauce is as thick as you want it, remove the bay leaves, ladle it into sterilized jars, and add acid. Top with lids, and process the jars in a hot water bath for 20 minutes at a gentle rolling boil. This sauce is musky, gentle, and robust. Cut the top off a head of garlic making sure the tip of each clove of garlic has been decapitated. Set the head of garlic on a piece of foil, drizzle the top with a smige of olive oil, and wrap it up tightly. Wash, core, and halve the tomatoes. Toss them with ½ cup olive oil, 2 teaspoons salt, and the black pepper. Divide the tomatoes between two large, sided baking sheets. Nestle the foil-wrapped head of garlic on one of the trays. Roast the tomatoes at 400 degrees for about an hour, rotating the trays as necessary. Some of the tomatoes will blister a bit—this is good. While the tomatoes are roasting, sauté the green pepper, onion, and jalapeno in 2 tablespoons olive oil until tender and translucent. Dump the roasted tomatoes into a large stockpot. Unwrap the garlic and squeeze out all the yummy mush. Add the garlic and sautéed veggies to the roasted tomatoes. Purée the mixture. Add the spices and sugar. Simmer the sauce to thicken, if necessary. Taste to correct seasonings. Ladle the sauce into pint jars, add acid, and process the jars in a hot water bath for 20 minutes at a gentle rolling boil. Sauté a peeled, diced carrot (or two) with the onions and peppers and when very tender, proceed as normal. The carrot thickens the sauce even more, adds extra nutrients and natural sweetness (you can completely omit the refined sugars), and turns the sauce a bright orange-red. Add a couple cups of zucchini when sautéeing the onions. Other fun seasonings: marjoram, fennel, smoked salt, thyme, etc. So now, tell me, ‘cause I know I’m not the only one going about this saucing business: how do YOU make pizza sauce? What are YOUR tried and true secrets? Yum… is there anything better than garlic + tomatoes? When I was researching the canning process for tomatoes several sources said I could use 2 tablespoons bottled, (not fresh because it is not standardized), lemon juice or 5 tablespoons vinegar. That sounded ridiculous to me, but they claimed that vinegar is less acidic than lemon juice. That didn’t sound right to me – any thoughts? They may be right…to a degree…but I think it’s unnecessary. If you’re feeling unsure, just go with the lemon juice as the vinegar (especially if you’re using it in larger quantities) can leave a taste. I think the measurements that I’ve included are fairly standard in the canning community, but everyone has different comfort levels. As long as your tomatoes are high acid, you’ll be fine. Hope that helps! 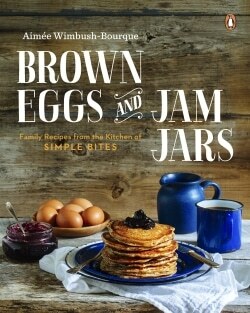 This sounds like a perfect project for the upcoming weeks, as I was planning on making homemade pizza soon. Although, I’ll have to find some fresh tomatoes first. Also, Amiee did a tomato sauce post several months ago, which you freeze, and it makes a fantastic pizza sauce. In the past, I’ve always just made triple or quadruple batches and frozen my sauce. When my fall tomatoes come in, I’ll definitely dedicate a Saturday to canning! Looking forward to it already! I don’t quite understand the part about acid. Does tomato sauce *need* to be at a certain level of acidity to be “safe”? I’m not sure what that all meant. But I was pretty happy to see this blog, because although I use a lot of tomato sauce, I don’t like the tomatoes themselves. 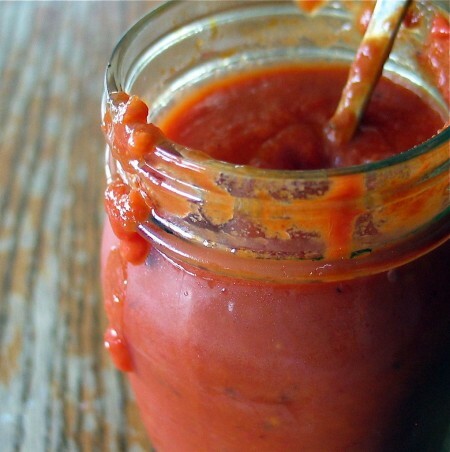 So I’ve been looking for a way to make tomato sauce that isn’t too…tomatoey. 🙂 It sounds weird, I know! I’d definitely make it without skins or seeds. Great question, Nikki! That’s the impression I’m getting. I also totally understand the too-tomatoey sauce option. My husband is the same way–tomato sauce? Yum! Ketchup? Sure! Salsa? Oh yes! Tomato on your sandwich? No way, Jose! Good questions! I’ll try to explain it the best I can. Non-acid foods have a pH of 4.6 or higher. Acid foods have a pH of 4.6 or lower. Most tomatoes are acid, but some new varieties have a higher, less-acidic, pH. Plus, when you mix tomatoes (acid) with other veggies/ingredients (non-acid), the end product has a higher pH. In cases like that, it’s important to add acid to bring the pH level back down in order to make it safe for canning. aah…I guess I didn’t realize this was in the context of canning. What will happen if it’s not acidic enough? Do you always put ‘a shot of acid’ like vinegar or lemon juice in everything that’s canned? Or only if it’s not already an acidic food? Sorry for my questions…I haven’t ever canned but would like to give it a go sometime soon. 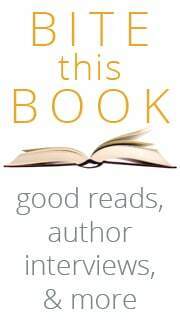 Maybe I should just go out and buy a book, hehe! Do NOT apologize for asking questions—it’s what smart people do! You do not need to add acid to certain canned foods such as applesauce, straight tomatoes (as long as they’re high-acid, of course), stone fruits, jellies, etc. Certain things are fine as long as you add enough vinegar to them—think pickled beets, pickles, etc. 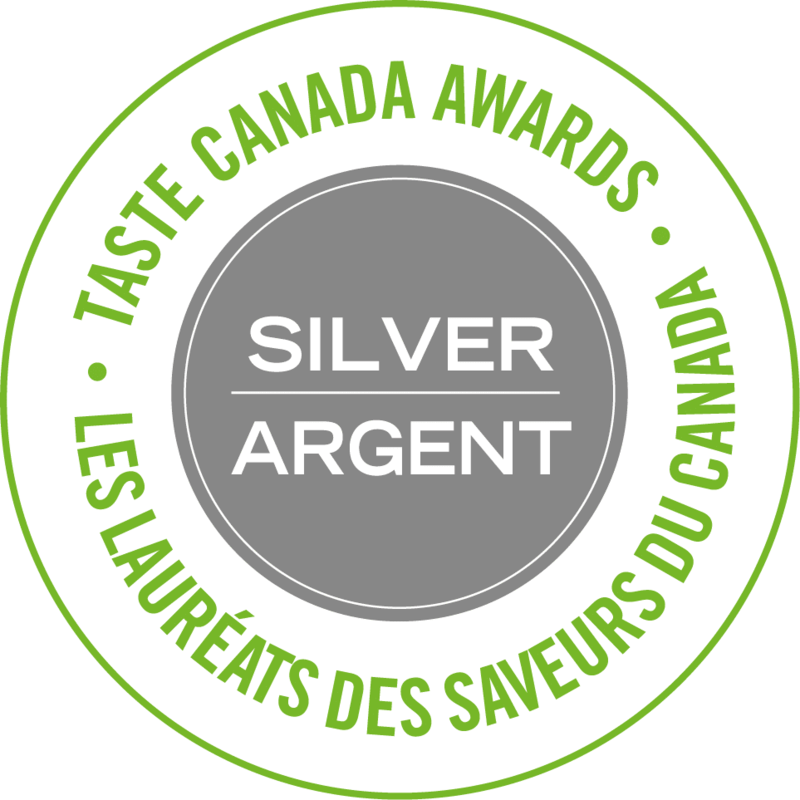 Other things, such as green beans, dried beans, and meats, are best canned only in a pressure canner. Just do a little research and start canning and you’ll be well on your way to becoming an expert. I love this post and as always, you give me so much fabulous knowledgable information! You seriously can’t go wrong with either of these! Adding all that basil sounds like a pretty fine idea. Makes me hungry just thinking about it! Quick question regarding method #3 in the saucing section… at what temperature do you roast the tomatoes for an hour? Thanks much! 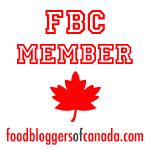 I stumbled across your blog! Thanks for the YUMMY recipes! We have 50lbs of fresh ROMA tomatoes and we are canning them soon. I think we will try your recipes and make some yummy sauces. THANKS! So my husband and I are going to can our tomatoes and I have a question regarding the acid… Do I add this to the mix before canning or after filling the jars? How much do I add?? Melissa, I add the citric acid after I’ve filled the jars—just dump the powder right on top of the sauce and then wipe the rim of the jars and lid and can them. Good luck! Nice article I really enjoyed it in my holiday. Why the sugar? Is it necessary for canning or can I leave it out altogether? The sugar is optional. It brightens the flavor, especially if the tomatoes are more acidic. But it’s totally up to you! I love love pizza. I love finding new pizza recipes and trying them out. My husband does not like pizza as much as I do, So I only make it when I know he is not hungry or out of town. I love your blog , I will definitly have to bookmark this page. Thanks this page is making me hungry!! Is there a reason I can not freeze this sauce? It is fine to freeze the sauce! I like to can mine because then it’s ready to use at a moment’s notice—no thawing involved. Also, by the end of August, my freezers are already stuffed with green beans, corn, spinach, and strawberries, so I end up canning all my tomato products. Frozen tomato products can sometimes get watery (I never freeze salsa), but if the sauce is already thickened, it should be fine. Hi! Great to be here 🙂 Thanks for your knowledge, I’m preparing my dough now . I followed Simplest Pizza Sauce, a formula. Thanks again ^_^. great site! I just made a batch of the roasted tomato and garlic pizza sauce following your exact instructions. I’m a little worry now after reading lots of other canning recipes as most need to be processed in water bath for at least 40 minutes and the large amount of olive oil used. Since the original post is from a while back. I’m assuming no one has spoilage issues so far? I think reading too many other sites has gotten me paranoid. Otherwise the sauce taste amazing! Thanks! I’m glad you like the sauce! I’ve been making batch after batch of it this fall. I think it’s my favorite. I’ve had zero spoilage issues. I know lots of sites call for more extensive water bath times, but I (and the plethora of my canning ancestors!) don’t think it’s necessary. If it worries you, however, you can always boil the jars of sauce for a longer time. Really, it’s up to you. FYI. 5 years later this is still the recipe I have to can every year. And we haven’t died from botulism! LOL. Thank you! I’ve enjoyed reading the comments and replys but my qsuestion is, what do you think the primary difference is between your basic pizza sauce and say a spagetti sauce? Thanks for the delicious recipe! I made the roasted tomato and garlic version. The roasting brings out exquisite flavors in the tomatoes! I made a few revisions … added 2 cans of tomato paste, 2 Tbl. Italain seasoning, and 2-3 bay leaves. Thanks again for sharing this recipe! I think it’s important to note that pizza sauce is never cooked. What you’re describing here are various takes on marinara (which all sound quite delicious), but it’s terribly misleading to call them “pizza” sauce because most novices cook their pizza sauce and wind up with this ridiculous “pizza” that tastes absolutely nothing like pizza. Proper pizza sauce is always raw. This is a great article. I realize I’m quite late but I do have a question. Is there anything wrong with freezing the sauce in batches? Canning sounds great but I’ve never done it and right now am not in the position to start a new project of that nature. I would however, love to freeze the extra sauce in small batches. Do you see any problem with doing that? Donna, Yes, you can certainly freeze the sauce. Just be aware that freezing tends to make tomato products watery. In other words, the texture will be changed a bit, but it’s perfectly safe (and in many cases, still delicious). Garlic & Tomato say no more! Thanks again for this great recipe! So excited…I made the one with herbs and vegetables last night and canned it all up too! Now I’m a bit worried that my acidity is not high enough. I canned in 250ml jars with about 1/4teaspoon of vinegar in each jar with the sauce and then hot water bathed for 20min. Now I’m wondering did I put in enough acid?? And should I be stirring in the vinegar after I add it, to make sure it gets all over the sauce?? Thanks for the help! I think that’s probably not quite enough vinegar—it should be about 1 1/2 teaspoons per cup. And no, you don’t have to stir the vinegar in—just add it after you fill the jars. It will mix in during the canning process. I want to thank you for this recipe. Last year I decided to can my own pizza sauce. My husband needs low salt, and I make pizza once a week. Store bought sauces have so much salt. I found this site and liked the idea of method 3. 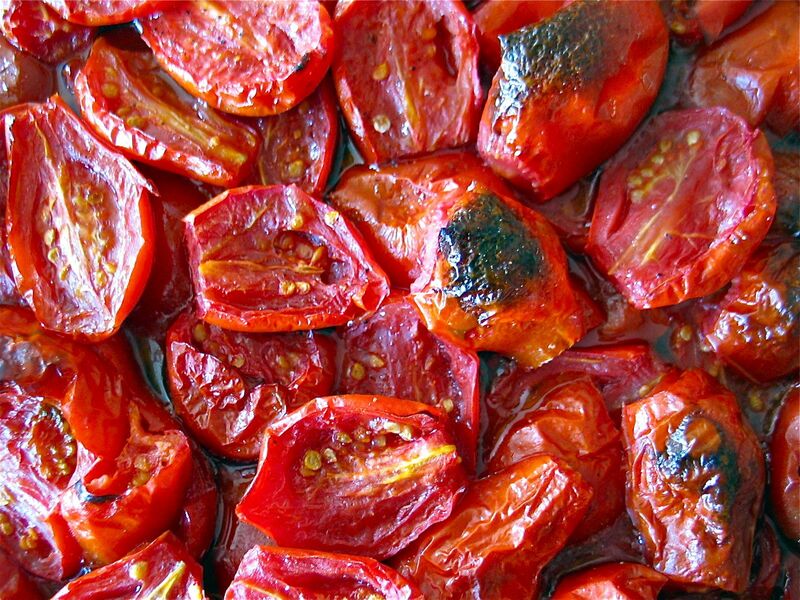 – roasting the tomatoes, since I wasn’t planning on using any salt, I figured roasting would give it more flavor. I decided not to use any spices either – just the roasted tomatoes. OMG! This turned out to be so delicious! I’ve run out since I use it whenever I need a good tomato sauce. I made it in small 4 oz jars, and made it very thick so more would fit in the jar. We don’t like a lot of sauce on our pizza, so I knew I’d waste most of it with 8 oz jars. When I use it I mix it with water till its just right. I used a pressure canner, so I didn’t add any vinegar. I’m certainly going to make more this summer – but I’ll be making double the amount. Thanks for the #2 recipe by the way. That’s the one I’m using the can pizza sauce! A ‘2016’ reply to your original post: Please don’t encourage people to water bath can this sauce recipe…it is not safe in regards to current NCHFP guidelines. I was looking through internet ideas of how to use my oven-roasted end-of-season tomatoes and will definitely try your recipe but I’ll freeze it to be safe. No way I’m going to risk my family’s health just for a pizza sauce recipe. Thank you for the seasoning ideas but please do edit this post for safer procedures. Sounds yummy. Do I have to boil the tomatoes after I roast them? Like is that a safety/sanitation thing, or only just to remove more of the moisture? Thanks! It’s just to remove the moisture, so feel free to skip the boiling, if you wish.